Raiffeisen Bank Shqipëri (Raiffeisen Bank Albania) is one of Albania’s strongest and most trusted brands. And with that trust goes great responsibility to be able to fulfill current and future customers needs and expectations. Today, when everyday banking is expected to be simple and straightforward, Raiffeisen Bank succeeded in delivering the most convenient way of banking to their clients and prospects with the support of their partner New Frontier Innova (NF Innova). Raiffeisen Bank is one of Albania’s strongest brands that ranked second in terms of assets, loans and deposits, at the end of 2016. Raiffeisen Bank has one of the widest branch networks in Albania with 81 business outlets and attends to more than 750,000 customers (data year-end 2016). It offers the full range of banking products and services to private individuals, micro, small and corporate business as well as affluent customers. Raiffeisen Bank is putting emphasis on customer experience and with its innovative strategy strives to deliver the best online experience. Following the trends that new technologies bring, Raiffeisen Bank recognized the challenges but also arising possibilities and started their digital transformation journey amongst the first in the banking industry. NF Innova is a member of New Frontier Group from Vienna, Austria, and is a leading digital banking solution provider, based in Serbia. Their business is focused on the development and implementation of the Omni-channel platform, alongside internet and mobile banking solutions, native apps and various partner ecosystem solutions. NF Innova has a strong focus on Digital Banking by leading transformation of today’s prime financial institutions with its innovative iBanking platform. NF Innova achievements were acknowledged by one of the leading global providers of market intelligence and advisory services – IDC MarketScape 2017 who recognized them as a leader in mobile banking solutions for the iBanking mobile solution, and most recently CIO Applications Europe named them one of the Top 25 Fintech Solution providers. Raiffeisen Bank and NF Innova collaboration started with the implementation of the Omni-channel platform that included internet and mobile banking application for both Retail and Corporate clients. Platform capabilities also include easy integration with new channels which made it very simple to incorporate self-service kiosk. 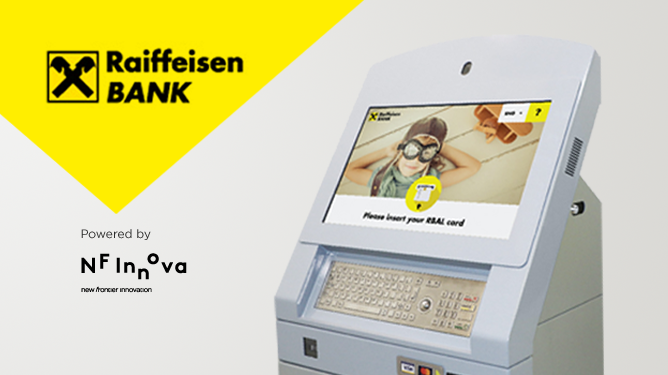 Having in mind their clients’ convenience, Raiffeisen Bank, with the support of NF Innova, implemented self-service terminals that provide straightforward banking for the customers. These self-service terminals deliver numerous benefits such as ease of access, 24/7 availability, reduced transaction time, access and control of all accounts, utility payments, card payments, transfer within owned accounts, transfers of money to other accounts within Raiffeisen Bank Albania or other banks in Albania, accounts and cards balance and transaction history control, viewing or printing credit card statements. Digital kiosks also include card readers that allow easy log-in through a familiar system that ATMs use. 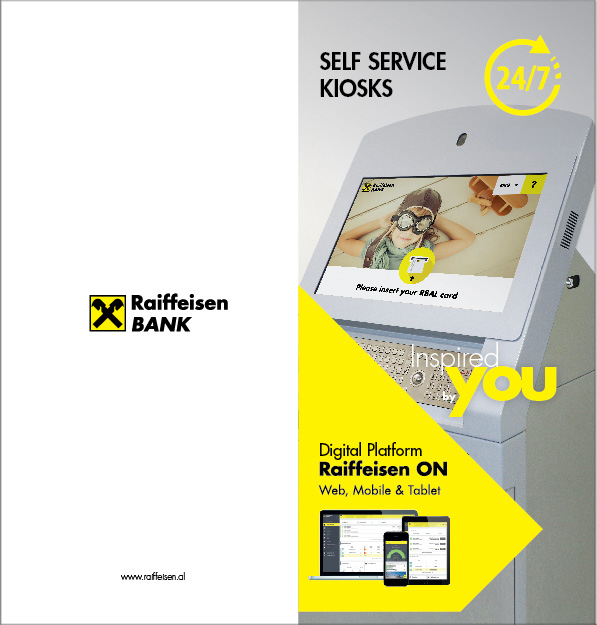 By including kiosk in their channel strategy, Raiffeisen Bank extend their online presence in the physical world and strengthened their relationship with customers by delivering its services when and where clients need them. “We are so lucky to have Raiffeisen Bank Albania for our partners because we share the same vision of true digital banking and same understanding of the importance of customer journey and customer experience. Omni-channel platform that NF Innova provides, makes every new channel integration smooth, without interrupting existing processes. Synchronization with other channels, already in place, is instant and management is easy with single point of administration. This makes it possible to deliver targeted personalized messages at the right time and place.”, stated Vasa Šegrt, CEO of NF Innova. “Digital technology is changing significantly the way banks communicate to their customers. In a very short time financial services have evolved from some traditional operations to online payments and deposits in the developed enviourement of mobile banking. The opportunity to offer clients the services they need through digital channels impacts the long term relationships.